Riders at PSC can request rides with Uber when leaving the airport. Learn how to receive these trip requests and get in on the action. Per PSC regulations, driver-partners must adhere to the terms below. Failure to do so may result in the receipt of a citation or even restriction of access to airport trips. Please note that Uber will not pay for any citations that driver-partners may incur. A copy of the city issued for hire permits for each driver-partner operating at the airport must be submitted to the airport administration office. When on airport property, the Uber driver app must be open at all times (driver-partners must not go Offline until exiting the airport area). Driver-partners must use the allowed pickup and dropoff locations only. Waiting in the areas in and around airport grounds, but avoid loitering at the terminal curb. The airport suggests drivers use the short term parking area. 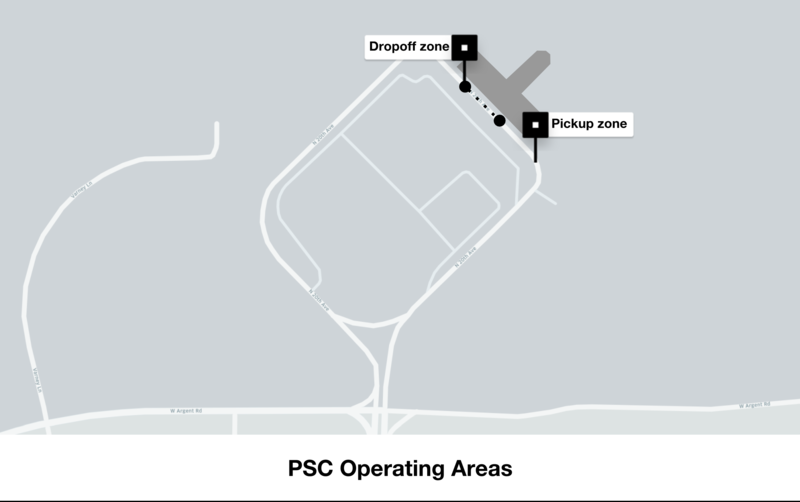 Once you accept a trip request, the pickup location at PSC is located at the curb on the south end of the terminal building just pass the pedestrian crossing(see map below). Based on the operating agreement with PSC, riders can be dropped off at the curb in front of the terminal building. Checking the arrivals schedule at Tri-Cities Airport can help you maximize your earnings with information about when flights will be landing at the airport and when it will be busiest. See PSC ARRIVALS SCHEDULE.